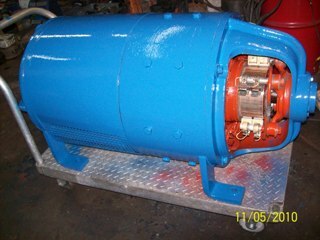 At Michigan Street Pump, we understand that electric motors are a critical part of your operation. Motor related downtime, when it happens, can cause some serious problems. With so much at stake, your motor repair contractor must provide quality repair and outstanding service in a timely manner. Michigan St. Pump performs every type of electric motor repair service from a minor repair to a complete rebuild and rewind of any type of AC or DC motor with fast, reliable service that is fully guaranteed. We have a modern, well-equipped shop with skilled technicians. We operate our own trucks for pickup and delivery in the Orlando area. Our repair services are available seven days a week, 24 hours a day. Call anytime and you will be greeted by a knowledgeable technician ready to assist your every need. Typical repair consists of disassembly and a complete inspection to identify both mechanical and electrical damage and wear. We do our own rewinding using the highest quality wire, insulation and varnish for a long-lasting, durable repair. All mechanical repairs, such as end bells, bearings, seals and shafts, are done at our shop. We thoroughly inspect and test each motor to verify that it meets all of the mechanical and electrical standards…and your expectations. We service and repair any manufacturer/model of motors up to 300 HP, including many that are no longer produced.